Motorcycle transportation service is becoming popular now a days. In Bangladesh it is a brand new idea. But when it is about Dhaka city this is very important for social correspondence. Traffic jam is a top priority problem to be solved. Motorcycle transportation is one kind of solution. It doesn’t take wide space. Bangladeshi roads are too much narrow having millions of vehicles like buses, cars, rickshaws, CNG’s. And the main victims of this circumstances are common people specially students and service holders. So motorcycle transportation service is very helpful to them. It is not too much costly like CNG and Taxi cab. So this transportation service is particularly for common people. In Dhaka this kind of alternative transportation service has a lot of opportunity to do a good job. Because man power isn’t a big issue here. Formulating plan and implementing is the main thing. And this proposal is a outline of this business. People are looking for a alternative transportation service. Motorcycle transportation will be the unique one. A motorcycle can go through the buses. The most important thing is mentally and physically this is a pressure free journey. But this transportation service only belongs to the city or town area. Young generation will be influenced to do something new by it. Because this can be a great earning sector for the 3rd generation. And surely Dhaka city is profitable for this business. It will also decrease the dependency on buses and private cars. Bangladesh is a developing country. And a good transportation service is very important for a developing country. No doubt about this Dhaka is a mega city. But the infrastructure of the city isn’t world class. Every developed and gorgeous cities are maintaining some particular rules but Dhaka doesn’t. Over 15 millions of people live here. But the transportation System is very poor here. Without a good transportation system it’s quite difficult for government to conduct the nation properly. Because traffic jam is a common phenomenal in Dhaka city. Quick solution is impossible here. So people should think something else something like motorcycle transportation service. It will reduce traffic jam. Because a motorcycle doesn’t take so much space. And of course it can go through buses and cars when you need to go early. Dhaka undoubtedly is the world’s fastest growing mega city According to the world Bank report, there are 15 million people living right now in this city, which will be more than 20 million by 2025 according to UN prediction. This mass population causes many problems but the traffic congestion is seemingly the worst. It is obvious that private cars increase the traffic jam. A common scenario in Dhaka city is clash between students and bus conductions. Hot weather coupled with this horrific traffic jam makes people sick every day. 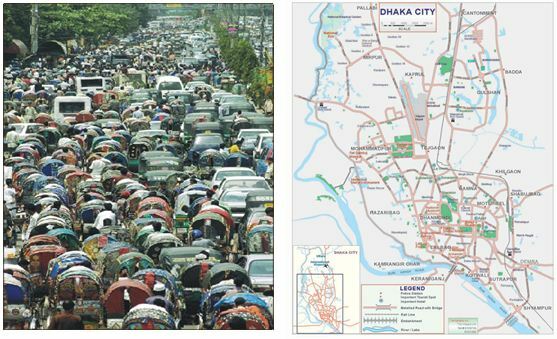 It is truly hard to bear this situation in Dhaka Lastly this intolerable traffic congestion affects all Dhaka inhabitants physically and mentally. 2. Formulating and implementing the plan is very important. This proposal outlines a study that will fill both of these needs. The consultants will prepare a detailed work plan for the service of motor cycle transportation within three weeks of start of a new transportation service to reduce traffic jam. Dhaka is a mega city. More than twelve million people live here. Day by day the number is increasing and most part of Dhaka is badly affected by the population growth. Thousands of transportations, but only hundreds of them are legal. This huge number of buses, cngs, rickshaws and other transportation are creating traffic jam. From time to time attempts are made to reduce the traffic jam, but the initiative usually produces no results. Almost there are no roads or street or lane free from traffic jam. Traffic jam is obstructing trade and commerce. Provide counsel and assistance in the collection and interpretation of information within communities. Identify resources for assistance or information during the course of the study. Lend credibility to the research effort. Provide feedback to the research of the survey. Offer concrete recommendations for action by the people for promoting the development of the proposal. Based on our study topic which is “Motor cycle transportation service to reduce the traffic jam” we will conduct our survey to find out the result how our new business plan will help the people on reducing the traffic jam. By our survey we will collect information from people which will help us to make a frame how should design our business plan. As because it is a service providing business plan so we must know that what would be the reaction on our target customers. Survey Instrument Design: At first we will go for secondary data to find out what is the present situation of the traffic jam in Dhaka city and the sources will be newspaper article, online article, television news and some other sources. Then after collecting some information we will go for our primary research which will be questionnaire survey. For the questionnaire survey we have chosen the close-ended questions. In our survey questions will be focus to know is the service would be affordable to the customer or not, is it helpful for them or not, is the service cost reasonable or not and some other aspects. This collected information is valuable to plan this business. 2. Survey Administration: To do our survey our target locations will be those areas where this service is eagerly needed. So that we have chosen some busy locations such as Motijheel, Dhanmondi, Farmgate, Banani and Gulisthan. The reason we have selected these locations because these are the areas where people face the traffic jam most. The identification of survey recipients would be derived primarily through school and college going students, university going students, working persons such as service holders, garment’s workers and etc. Using sampling techniques to ensure appropriate representation among sectors and geographic areas, a final sample will be identified. Once identified and coded, mailed surveys will be administered, where possible, personal site or telephone interviews will be conducted to increase response rates. Provide objective data with guaranteed confidentiality and methodological consistency. Include qualitative responses to provide insight into problems/solutions for starting the service of motorcycle transportation in Dhaka city. It is anticipated that two separate data bases with integration capabilities will be developed for questionnaire responses and secondary data. The data base will function on an interactive basis in order to permit comparative (sectoral and geographic) analysis of economic effects, direct vs. indirect efforts and etc. In addition, classification and coding will permit analysis of the role of the “motor cycle transportation service” as a regular and affordable service. The data base will be developed using one of several software packages specifically suited to appropriate compilation and statistical analysis required. 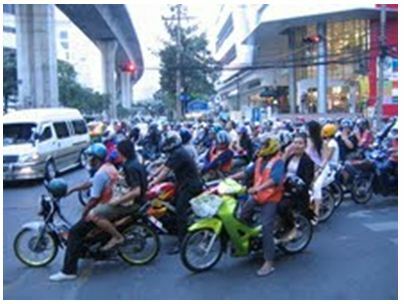 The analysis will identify the economic interaction of this motorcycle project and also other sectors of the traffic jam. At present the traffic jam is the main problem in our urban life. And this project will be very helpful for reducing traffic jam. By using motorcycles the fuel cost will also reduce then it will be profitable for our economy. This project will help us to reduce unemployment problem. Many students can drive the motorcycle as a part time job. Our unemployment woman can also take part of this service. This motorcycle cost is affordable for all sectors of people. It will be a great income source for the unemployment people as well as it will fall positive effect on our national income. Following analysis and interpretation of the survey results, round table discussions will be held, and interviews with people from different areas with different backgrounds will be conducted. This feedback will verify survey results, provide qualitative insights about the survey results, and generate recommendations for promotional efforts by the department. Upon the completion of research and analysis, a master report detailing the full scope of the study, including purpose, methodology, survey results, discussion of qualitative findings, and recommendations will be submitted to the department. An executive summary report will also be prepared for general distribution by the department. In addition, fact sheets on the findings will be prepared for distribution by the department. 1. Shish Mohammad will be the project director. He is mainly the author of this proposal. He will maintain link with the communication minister. 2. Sajeeb Hossain and Asaduzzaman Asif will be work as center coordinator. They will maintain relationship with the automobile companies and make schedule for center project. 3. Shidur Rahman, Bepasa Ara and Shejuti Habib will be the project Evaluator of this project. They will collect information from general people and from other aspects and help to the staff and to take important decision of the project. 4. Sonjoy Debanath and Juel will work as technical manager. They will responsible for development of the study methodology, administration and analysis. We would also make sure that all operations are carried out in line with BANGLADESH ROAD TRANSPORT laws and regulations. These govern vehicle safety, controls on fuel emissions, driver hours, customs requirements, and the transportation of food, livestock and hazardous goods. We would normally work about 40 hours a week, but this may include shiftwork and weekends to cover 24-hour operations. Our time would be split between the office time. A common way into this role is to develop our transport skills as a driver, teamleader or administrator, before applying for promotion to road transport manager. Management experience from other sectors may also give you an advantage when looking for work. We are going to concentrate in marketing at the newspapers, universities, schools, colleges of Dhaka city, and advertisements. Newspaper is the easy way for marketing of this service as most of the people from this city is into reading newspaper. Students are those, who face the traffic jam most. Consult with them to promote this motor cycle transportation service is another way. And not to forget the advertisements. Texas University of USA. He has participated in numerous seminar and open discussion with Communication minister of Bangladesh to solve transportation problem of Bangladesh. Project coordinator Asaduzzaman Asif has seven years working experience as an automobile engineer of Bajaj Motors limited, India. He is a guest executive engineer of Roads and Highway (R&H) Bangladesh. His throughout knowledge of technical management will develop working process of the project. Bipasa Ara is a graduate of Economics from Dhaka University. She has a comprehensive educational experience in data organization, questionnaire design, and public feedback analyses in support of economics studies including economic base survey and analyses. Beside these, project evaluator Sejuti Habib has conducted numerous economic impact analyses. This business plan presents a persuasive and innovative system for organizing and running an alternative motor service. An entrepreneur with a new improvement on a traditional business will find this plan’s clear logic instructive. The comprehensive overview of industry practices and their shortcomings.